Posted by Shelley Grell on July 6th, 2015. Kids expect their parents can solve anything. Even widely promoted computer games with expensive plastic characters and accessories can be fixed, right? Wrong. Seven months ago Santa’s Christmas present of the heavily advertised new “Skylanders Trap Team” tablet game (which cost Santa more than $100) ended up being incompatible with our son’s 1 year old tablet. As he was so excited to get the game, we were forced to pay $650 to get a new compatible tablet – a Samsung Tab S – which was one of the latest notebooks listed as compatible with the Skylanders Trap Team game. We installed the software and the game worked – resulting in a very pleased son with a very expensive early birthday present. Over the next 6 months our son got more involved with the game, and eagerly spent his hard earned pocket money every month buying as many Skylanders figures and accessories as he could afford (worth between $20-$30 each). Last Friday, after being awarded a certificate from school, we treated him to three more Skylanders characters. He excitedly opened them up when he got home and fired up his tablet only to see his game crash over and over again with a simple message appear on the screen saying ‘Unfortunately Trap Team has stopped’. Showing his empty wallet after buying useless Skylanders characters. Top right insert is the error message saying ‘Unfortunately Trap Team has stopped’. He tried again and again. But his precious Skylanders Trap Team game was dead. Unplayable. Unfixable. And his figurines, games portal and console had become little more than expensive plastic ornaments. Being tech savvy, I tried everything to fix it – right through to deleting everything on the device and doing a hard factory reset. Nothing would get the game to work. I searched everywhere for help online to no avail … that was until I came across the many reviews on Google Play from other upset parents venting their frustrations with Activision – the game developer. I found suggestions that it might be a software incompatibility issue between the Samsung Tab S and the latest upgrade of Android Lollipop 5.0.2. Yet nowhere on Activision’s site can you read anything helpful about this. No explanation given. No advice as to when it might be fixed. No link to help. And yet the site still confirms that the game is compatible with the Samsung Tab S! So we’re left in the dark. Except Activision of course. In this connected world there is no way Activision can possibly have failed to notice the climbing angry reviews and dramatic rise in one star ratings for the Skylanders Trap Team game – a stark contrast to the former 5 star rating. Judging by the feedback dates it seems Activision has known about this for months. Yet they’ve done nothing. 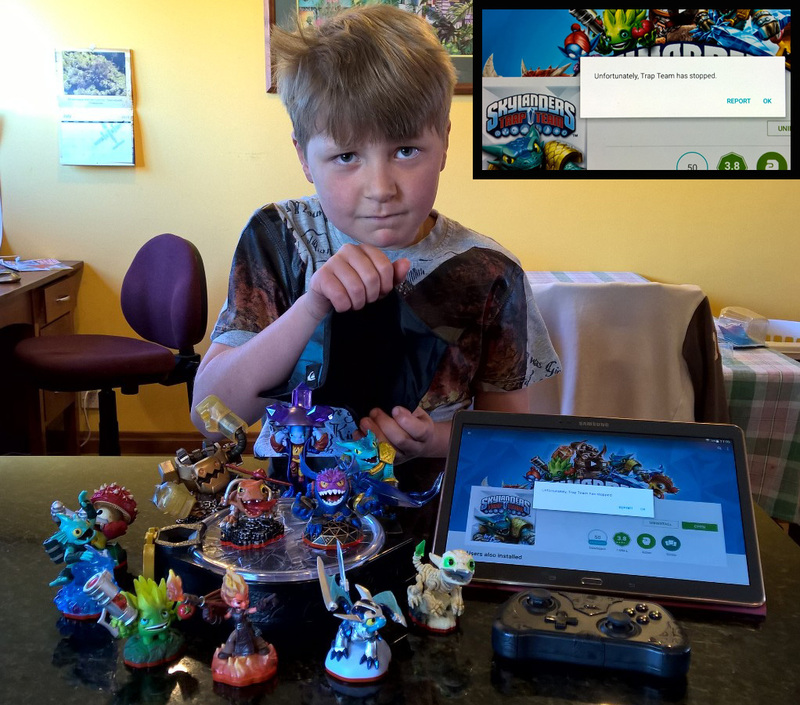 With over 50,000 downloads of the Skylanders Trap Team game, I wonder exactly how many parents around the world have children like mine who are deeply upset with the loss of their much loved Android game? And how many are annoyed at the huge expense they’ve had to fork out for just a few months of joy? And what do the retailers think about refunding us? Whether it is Activision, Samsung, or Google Android that is to blame for this game fail, Activision should by now – at the very least – have shown corporate responsibility with a demonstrated commitment to fixing the problem, and communicated and apologised to the many children they have let down and to the many parents and care givers they have frustrated. It is not just a game fail, it’s a disgrace, a sham, and a massive PR fail. In the last two weeks I have had three games reviewers, one toy buyer, and a supplier all trying to get response from Activision without success. The retailer had even given my contact details to Activision on request, but they neither called nor emailed. Today our local retailer came back saying their buyer was told by Activision that they’re working with Google and Samsung and hope to have a fix within the next 2-6 weeks. It’s now four months since this issue first appeared in reviews on Goggle Play when parents started complaining. Should we trust that anything will be done in 6 weeks? Thankfully our retailer has very kindly agreed to refund every Skylanders figure and the starter pack we purchased. Activision, tell us. Do you deserve the benefit of the doubt? I just read this update in Activision FAQ online. No date, no timeframe, and not truthful. Other reviews on Google and Amazon confirm the incompatibility is not just limited to Samsung devices; Kindle and other Android devices are also incompatible with the Skylanders Trap Team game for tablets. Q. The latest Android update has made the game unplayable. What happened? A. We are currently investigating the reported problems with the latest Android update. So far, it seems these problems are limited to Samsung devices on which users have recently installed Android 5.0.2 Lollipop. We are working to determine the exact cause, and to develop a solution for impacted players as soon as possible. If you are experiencing gameplay issues after installing Android 5.0.2 Lollipop, please call 1-844-HELP-EON. 3) try every suggestion I could find – including those in your responses to other parents’ questions on your community pages. From deleting the data and all our files, photos and videos to free up over 6GB of space, reloading your massive game about 10 times, and resetting the tablet about 5 times. All to no avail. 4) I have questioned you myself and regularly logged in in vain for any response over the last few weeks. 5) I’ve asked games reviewers if they knew how to contact you. They looked into it, asked their contacts at Activision with no response. Finally they gave me an 0800 number, which I called and managed to talk to someone at last and relay my frustrations. 5) I have had to explain to my 8 year old who hasn’t a clue about hardware/software compatibility and programming, or who is responsible for this mess, why I can’t fix it – almost EVERY DAY this month. Activision, I am a working mum, a tech PR person of 22 years, and a former programmer – so I’m very tech savvy. I know how a large corporate such as yourselves should respond. Activision hasn’t met my expectations, or that of the many parents who’ve been asking you why Skylanders Trap Team has not been working since their tablet updated to Lollipop 5.0.2 from April this year. Do you honestly think I will be placated with a video game or a Skylanders character, when I have just found out that you are dumping Android support in future Skylanders games? I have had to pay $700 for a Samsung tablet and accessories just so my son can play the Skylanders Trap Team game that Santa got him, plus a further $300 on characters. That’s a $1000 PLUS all the hours I have spent on this matter!! But let’s say I were to accept your measly offer. I’ve just read that you will not be supporting Android when you launch Skylanders Superchargers in September this year (see: https://www.reddit.com/r/skylanders/comments/3a0e5s/ios_or_android_tablet_for_trap_team/). Why should I believe that you will continue to support Skylanders Trap Team on Android? How much more should we spend on your characters until you drop the game, even if you manage to fix it? Correct me if I am wrong, but even if you do manage to get Skylanders Trap Team working on the Samsung Tab S again, you won’t support it for long. And I would still eventually have to purchase an Apple iPad just so my son can continue to play your game. If you want to offer me compensation – buy my son a top of the line 10.5” iPad and give him assurance that he can use his existing Skylanders toys and portal with the iOS version of the game. 1) Make a public announcement to all parents, toy buyers, stockists and retailers that there is a compatibility issue with the trap team game. This game is still being sold. You have a responsibility to your consumers to provide a product that works. 2) Apologise for taking so long to address this issue. 3) Commit to a date when the game will be fixed and for how long. 5) Explain why you are not supporting Android when you launch Skylanders Superchargers in September this year. I am reluctant to waste another minute or cent on your game and toy combos if you can’t be bothered to support them or help frustrated parents for months. And I will not purchase any more similar games from you that hold parents to ransom like this. I await your response with anticipation. Unbelievable! Today, thanks to a 1 Sept review on Google Play, I discovered that Activision has finally updated Skylanders Trap Team on Lollipop!!!! After three months questioning them in vain, it would have been nice if they informed me directly. So I wrote to my contacts in Activision customer support and discovered that they too didn’t know that the update was done. Way to go Activision development team – keep everyone in the dark and pretend like nothing happened. My son will now force me to suffer this upgrade … until the next Android update. Thankfully the retailer has said that they will honour their offer of a full refund when your #gameFAILs again.